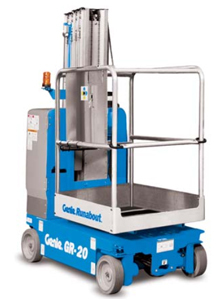 Genie Runabout (GR) lifts are compact, low-weight machines well suited for increasing productivity on the job. Efficient operation and convenient setup make the Runabout™ family models ideal for warehousing, stock-picking, transporting, inventory management, and general maintenance. Genie Runabout Drivable at full height. Genie Runabout Compact and low-weight; fits in most passenger elevators. Genie Runabout Can be driven through doorways with operator on board. Genie Runabout On-board diagnostics for convenient service. Genie Runabout Auxiliary platform lowering – enables descent in the event of a power failure. Genie Runabout Hinged rear covers for easy access to major service components.